If you haven't already, go vote in the Well Fed Food Blog Awards! The Network has undertaken a huge and mostly thankless task by doing the awards. By going there and voting you can show your support for them and their hard work. Well, and I guess maybe you're showing your support of me, too! The sites I am nominated with are all really great sites. Make sure you check them out when you are there! 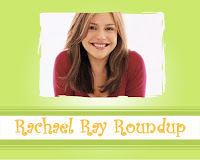 Now, time for the Rachael Ray Roundup - a collection of all things Rachael Ray from the internets (tee hee) generally and the blogosphere specifically. If you write a post about Rachael Ray, please drop me a line a everythingrachaelray at gmail dot com and let me know so I can include it! Four of the top ten best-selling cookbooks in 2006 were written by Rachael Ray, according to the New York Times and Nielsen BookScan. Talk Show Ratings Update: After discussing how ratings for new syndicated talk shows have remained flat, Broadcasting & Cable reports: "At the other end of the rookie ratings spectrum is Rachael Ray, who continues to dominate the new class with ratings higher than the next two new talkers combined. Ray averaged a 2.1, unchanged from the week before, but including new ratings highs in six of the top-50 markets." Good news! One expert interviewed by the Atlanta Journal-Constitution says hat Rachael is in and Martha is out: "Rachael Ray is to 2007 what Martha Stewart was in 1997," Salzman explains. "We always thought of Martha as perfect and brittle. We see Rachael as casual and friendly." Did you see Jenna Fischer (Pam from the Office) on Rachael Ray's talk show? Jenna blogged about her experience on MySpace and says "I really liked Rachel Ray a lot. She is a total sweetheart. And, I really do watch her show every morning from my trailer at work. For some reason I am always changing clothes when she is on." Thanks to Mike at TV Food Fan for the tip. Eat the Press, part of the The Huffington Post, named Rachael Ray one of its Media Winners of 2006. The Daily Dish, a blog for the Honolulu Advertiser by Cat Toth, included Rachael in its 50 Most Interesting People of 2006. The Celebrity Chefs Blog recommends Rachael's Her Crab Salad Bites on Endive for a party because they "are easy to make and a delicious way to get started at your party." Ali at Something So Clever included Rachael Ray's PB&J Cookies in her list of her top 15 recipes of 2006. With as many recipes as Ali has made, that's quite an honor. ERR reader Rachel started a fun new food blog called Rachel's Bite. Among the first few posts are reviews of Rachael Ray's Kick Start Kiwi Smoothie and her Tuscan Cacciatore Risotto. Eating Well on Dialysis tried 5-Vegetable Fried Rice with 5-Spice Pork and pointed out that making it yourself means you can control all the ingredients, unlike when you order from that take-out place around the corner. I tried this one recently and it's a keeper. So if Rachael Ray showed her love of Kiki of Rock Stilettos for being a subscriber to Every Day with Rachael Ray by sending her a box full of goodies, does that mean Rachael Ray hates me? No goodies for Madeline? Really? Let's Eat! shares a recipe for Turkey and Wild Mushroom Meatloaf Patties with pan gravy and a hefty dose of skepticism about whether it can be made in 30 minutes. Jasmin Guleria of Beauty News NYC recommends 30-Minute Get Real Meals: Eat Healthy Without Going to Extremes as part of a New Year's resolution to eat healthier. If you live in Texas, enter this contest by KXAN to win "a living room set from Ashley Furniture Home Store consisting of a sofa, loveseat, coffee table and two end tables, valued at $1199. You could also win a Rachael Ray 2, 4, 6, 8: Great Meals for Couples or Crowds cookbook." Hey Madeline...I did a few RR recipes this week. Am I being snubbed from the Roundup? :) I know you don't usually do repeats, but I did make one dish (that chicken and broccoli mac & cheese) that was new. Home Cook - Never! Have you added A Taste of Home to the Google Blog Search? That's what I usually use to compile the Roundup, since Technorati has so many splogs. I got a lot of emails with posts this week, so I didn't do the usual circuit of sites (including yours) to find Roundup Fodder. Everybody - here is the Home Cook's Mac and Cheese with Chicken and Broccoli! I think we have a cooking mind meld because I made that this week too! Just haven't blogged about it yet. Thanks for the link, Madeline. Controlling ingredients is especially important for people on dialysis, but it's good for anybody who is watching their waistline ... or who just want to make sure they're eating the good stuff! That's why I love Rachael's recipes -- fresh ingredients, easy and quick to make. Thanks, Lee Anne! My Dad has diabetes, so I am always on the lookout for recipes with the least amount of processed foods for him and out of fear for myself! That's been one of the main benefits of my trying Rachael's recipes - I eat waaaay more fresh veggies and fruit than I ever did before.